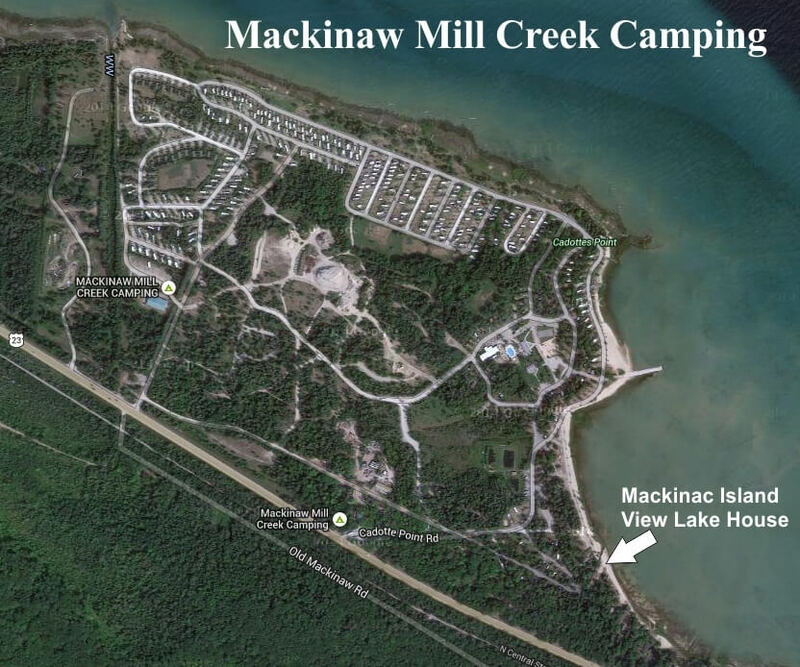 We now have a Lake House rental available at Mackinaw Mill Creek Camping! Located next to the camp, it is situated close to other waterfront cabins and sites if you want to make it a part of a group reservation. However, it has it's own driveway if you want privacy and isolation. As it's name suggests, it is on it's own little beach and it has a view of Mackinac Island! Linens & bedding are provided. Sorry, NO pets, NO smoking & NO small children (under 5) inside Lake House. ...More about the Lake House below! You can use all the campground amenities (in season), including the heated pool, park store, miles of roads and trails, playgrounds, basketball courts, 1 mile of shoreline, etc. The Lake House has a private driveway, which is narrow and wooded, so no trailers are allowed. Events such as parties or weddings are not permitted. Limit of two vehicles, including any overnight guests (rates include one vehicle, 2nd vehicle must purchase a pass). Maximum limit of 6 people. The Lake House is not childproof and no children under the age of 5 are allowed. See our complete list of Terms & Conditions for more details. Available for rental through Mackinaw Mill Creek Camping (CampMackinaw.com). A house on a private lot viewing Mackinac Island. We will be continually upgrading the décor, furnishings and appliances so video may not be totally up to date. Checking In: You will check in and check out at either Mackinaw Mill Creek Camping (May through October) or the camp's winter office (November through April). Other than that, our staff is easily available by phone! There is a 2-night minimum stay. Deposit of 33% is due at the time of booking. See our complete list of Terms & Conditions for more details. Location Overview: This peaceful location is within 3 miles of Mackinaw City and the ferry docks to Mackinac Island, which is one of the top vacation destinations in Michigan. Getting Around: You will need your own car, but if you are a bike rider there is a trail that goes from Mackinaw City to Cheboygan just across the road (US Hwy 23). That way you can avoid you or your children riding near the highway. The bike trail is maintained and a great place to ride. You can use the camp's free shuttle to the Mackinac Island Ferry Docks. Is there fishing at the lake house or anywhere in the campground? The lake levels have just recovered from an extremely low water point. All that water you see in the bay (in front of the house) has only come back there about a year and a half ago. It may take a few years for the fish to come back to our shores, however, there is excellent fishing in the local area. We usually suggest people stop at Coffman’s Hardware and ask. They sell fishing licenses and they can direct you to a local spot where you’d be likely to have the best luck. Are you able to swim in the lake right there? You can wade as the water is shallow there. Most people go to our boat launch area, but people do wade in the bay. Yes there is a firepit. You can see the beach in the video. It changes from year to year depending on lake level, but is sandy. The lake is shallow there as the house is on a bay.